Abstract. The values of the snow and soil thermal conductivity, ksnow and ksoil, strongly impact the thermal regime of the ground in the Arctic, but very few data are available to test model predictions for these variables. We have monitored ksnow and ksoil using heated needle probes at Bylot Island in the Canadian High Arctic (73°N, 80°W) between July 2013 and July 2015. Few ksnow data were obtained during the 2013–2014 winter, because little snow was present. During the 2014–2015 winter ksnow monitoring at 2, 12 and 22cm heights and field observations show that a depth hoar layer with ksnow around 0.02Wm−1K−1 rapidly formed. At 12 and 22cm, wind slabs with ksnow around 0.2 to 0.3Wm−1K−1 formed. The monitoring of ksoil at 10cm depth shows that in thawed soil ksoil was around 0.7Wm−1K−1, while in frozen soil it was around 1.9Wm−1K−1. The transition between both values took place within a few days, with faster thawing than freezing and a hysteresis effect evidenced in the thermal conductivity–liquid water content relationship. The fast transitions suggest that the use of a bimodal distribution of ksoil for modelling may be an interesting option that deserves further testing. 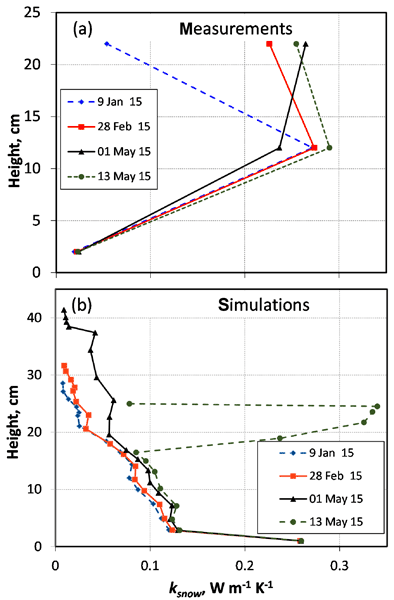 Simulations of ksnow using the snow physics model Crocus were performed. Contrary to observations, Crocus predicts high ksnow values at the base of the snowpack (0.12–0.27Wm−1K−1) and low ones in its upper parts (0.02–0.12Wm−1K−1). We diagnose that this is because Crocus does not describe the large upward water vapour fluxes caused by the temperature gradient in the snow and soil. These fluxes produce mass transfer between the soil and lower snow layers to the upper snow layers and the atmosphere. Finally, we discuss the importance of the structure and properties of the Arctic snowpack on subnivean life, as species such as lemmings live under the snow most of the year and must travel in the lower snow layer in search of food. 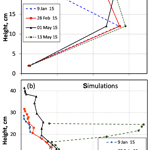 How to cite: Domine, F., Barrere, M., and Sarrazin, D.: Seasonal evolution of the effective thermal conductivity of the snow and the soil in high Arctic herb tundra at Bylot Island, Canada, The Cryosphere, 10, 2573-2588, https://doi.org/10.5194/tc-10-2573-2016, 2016.